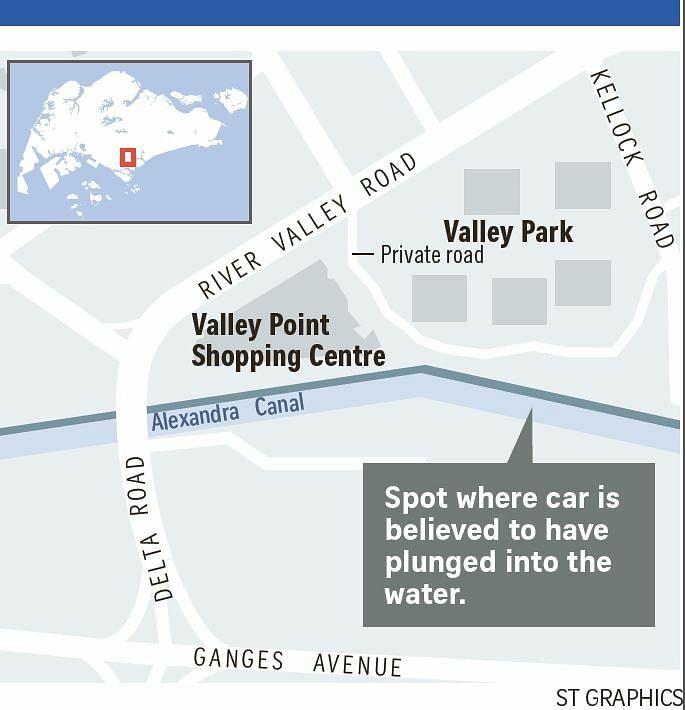 SINGAPORE - The bodies of two women, believed to be mother and daughter, were recovered after a car plunged into Alexandra Canal on Sunday (Jan 24) night. According to Chinese-language newspaper Lianhe Zaobao, the two women were both long-haired and fair-skinned. One wore a T-shirt with black and white stripes. Eyewitnesses told The Straits Times that a silver Mercedes emerged from the carpark of Valley Point Shopping Centre in River Valley Road at around 9pm. It drove straight into the bushes next to Alexandra Canal before hitting the water. A 33-year-old man, who saw the accident happen but declined to be named, told The Straits Times: "I heard a loud bang as the car hit the barrier before it went straight into the canal." The police and the Singapore Civil Defence Force arrived shortly after, as about 200 people gathered near the canal and the mall to see what was happening. A floodlight was installed and a ladder placed at the spot where the vehicle was believed to have entered the water. The Straits Times understands that the bodies of two women have been retrieved from the canal. Their nationality and age are unknown. On Dec 22, 1993, a Ford Laser plunged into the Singapore River near the junction of Boat Quay and Tew Chew Street at about 5am. The 22-year-old driver drowned in the accident. A similar accident happened two years earlier, on March 27, 1991. A taxi driver blacked out behind the wheel and drove into the Singapore River at high tide about 100m from the scene of the December 1993 accident. The cabby was rescued by a hawker who dived into the river after witnessing the accident. And on June 24, 1989, five people were killed when a Toyota Corolla plunged into the Singapore River near Clarke Quay during heavy rain.